Nota - El FamilySearch Wiki no esta disponible en Español en el momento. Cuando este en Español lo anunciaré. Back in September 2007 I posted about the FamilySearch beta launch. Since that time the site has gone through some changes, hopefully making it much better for all of us. If you are not familiar with FamilySearch Wiki I'll give you a little background. Many of us have visited http://www.familysearch.org and used the Research Guidance and/or the Research Helps. Both these resources are very under used, mainly because they are hidden on the site, and 99.9% of them are in English only. FamilySearch decided that it was taking them way too long to update and revise these wonderful resources, so they turned to a Wiki or desktop publishing model. On https://wiki.familysearch.org you will find much of the same information as in the old Research Guidance and Research Helps, but now anyone can update it, or in other words - make it better. 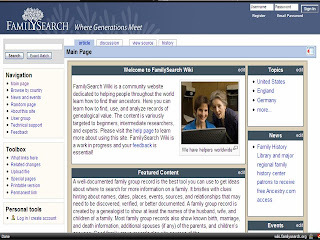 It is important to note that even thought the guidance and helps provide the foundation for the content, you can add new articles on exciting new databases, news, or anything else you feel is worth sharing with the genealogical community. It's an exciting new way to get help researching your ancestors. FamilySearch Wiki is still in beta, but a new beta. The site administrators hope to have several thousand of new registered users over the next couple of months. For the moment the site is only in English, but you can expect more languages to follow shortly. Try it out for yourself - you'll be surprised at how easy it is to add additional information.